Okay, I’ll admit. I might as well get it out of the way first. I am not a car expert. I can (convincingly) pretend to be an expert in a lot of things, like yoga, shopping, cupcake tasting, interviewing Canadian bands, movies that start with the letter “T.” But not cars. However, because I can add “expert shopper” to my resume, I do feel qualified to write about making smart purchases, for reasons of finance, fashion and function. Before heading there, I polled our readers on the main factors that were most important to them when consider the purchase of a first car. Coming in at a massive 73% was cost. The car needs to be affordable. Add it to the checklist. The second main factor was the look. Fazers want to know that their cars, like their clothes, are accurate reflections of their personalities. Makes sense. Write that one down, too. The third factor, which delighted me to see, was the footprint. Because Faze readers are invested in their future (which includes the future of this planet), they wanted to make sure any car purchased was as environmentally-friendly as possible, while still being afforable to them. Number three, on the list. So, while chatting with the Nissan experts and taking a few test-drives out and around Montreal, I kept these three main factors in mind. I also added one more of my own: function. In order to be the right purchases for a first-time car owner—who is most likely headed off to another city for college or university in September, or starting their first job and in need transportation to and from—the car has to not only be a reliable vehicle for getting from A to B, but also emcompass all the comforts and necessities along the way. The Nissan Versa Note starts at $13,348 and goes up to $19,018, depending on the package that you choose (manual/automatic, conveniences like heated seats, etc.). Is this a lot of money? Yes. But for a brand new car? Try and find something more reasonable. I dare you. 91% of those polled in our survey said that their parents would most likely pitch in and help with the first purchase of a car, if life demanded a vehicle. Well, a lower price-point is a major selling feature for Mom and Dad (aka the bank). Also, you have to factor in the cost of fuel—a major expense for car-owners. 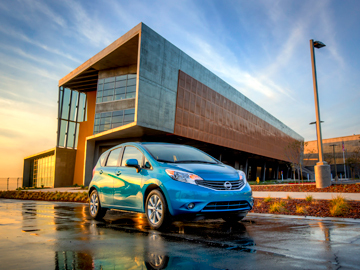 The NIssan Versa Note has great fuel efficiency: 6.1 L/100km (City), 4.8 L/100km (Hwy) and 5.5 L/100km. What does this mean? You won’t be stuck at the gas pump, draining your account, as much as the next guy. While it does come in a variety of colours (8, to be precise), I got to drive around in a sporty, teal baby (the colour was called Metallic Peacock) that sparkled with my personality (too cheesy? okay, I’ll tone it down. But the paint was all sparkly. Honest.). The steeply sloped windshield (which also helps to provide great aerodynamics, less drag, translating to better fuel economy) and “squash line” swoosh along the side (which is inspired by the trajectory of a squash ball hitting a wall—too much information?) 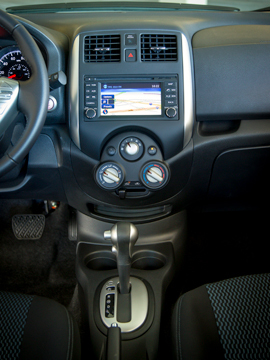 both contribute to the Versa Note’s sporty look, which not all sub-compact cars can boast. Your friends better get ready to be jealous. Not only is great full economy (see in “Cost” section above) good for the wallet, but also for the planet. No, it’s not a hybrid, but it is the next best thing. Now, go hug a tree, just for good measure. You know, karma and all that. 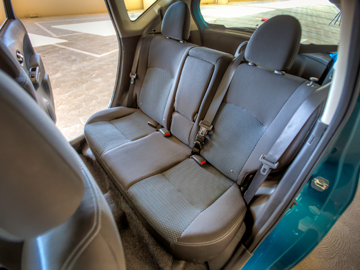 One of my favourite things about the Nissan Versa Note is the incredible space inside. I’ve never seen a car of this size have so much room in the back seat. So, when you’re transporting your friends who are taller than four foot seven, they won’t have their knee caps squished into their eyeballs. Then can relax and chill, with plenty of leg room to spare. Also, speaking of space, the trunk is a magical place. It’s probably why I climbed right in. 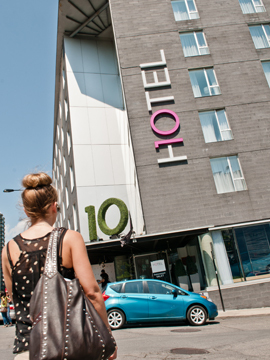 Trust me: if you’re lugging all of your stuff off to your very first dorm room, you need the space. It also has a really cool Divide-N-Hide adjustable floor, so that you can tuck things out of view in your hatchback, or separate your stored items with different levels. So, stretch out, pack in your life’s belongings and rock out to some tunes. It’s going to be a great first ride.